Lao PDR has made great progress in increasing access to education over the past decade. However, in many remote and disadvantaged communities, a lack of teaching and learning resources and high rates of dropout are undermining education outcomes, particularly literacy. The BEQUAL NGO consortium comprised of Plan International, Save the Children, ChildFund and World Vision, is helping to improve participation of disadvantaged girls and boys in 171 schools and communities across six remote districts of Luang Prabang, Oudomxay, Houaphan and Khammouane Provinces.The Consortium is supporting a range of community activities to help children learn, practice, and enjoy reading Lao language. They are establishing book banks, organising reading camps and reading festivals to promote a love of reading, and holding parents’ awareness sessions on the importance of reading. The project began in February 2017, by training participants from the NGO Consortium, District and Provincial officials in techniques for reading promotion. 40 community volunteers and 40 parents from target villages participated providing valuable insights into the community environment. From March 2017, the Consortium conducted community meetings to engage communities on reading promotion, established 171 book banks and distributed more than 43,000 books. Local communities have enthusiastically participated and have contributed resources to start the process. For example, in Houaphan the communities donated bookshelves to display books in schools. Ms Phouang Bounmeexay, a 28 year-old teacher at Pawan Primary School, Xamneua District has received three bookshelves. 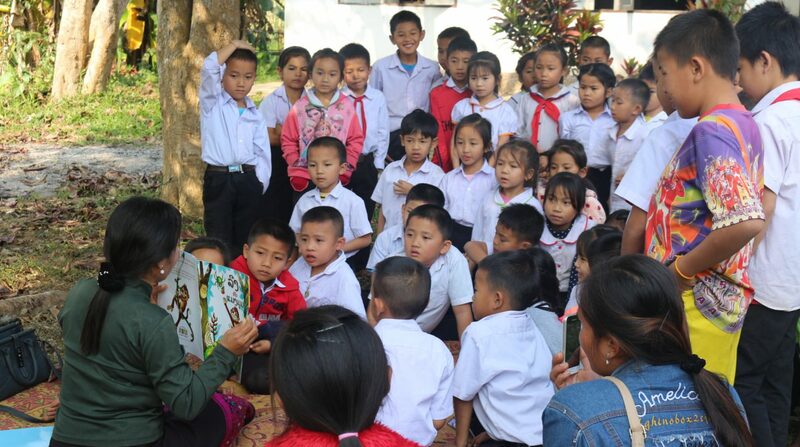 She notes that “this has motivated students, including non-Lao speaking students in our village, who are not confident in reading in Lao language, to come and look at the books and talk about pictures”. The Consortium is now training village volunteers to run reading camps for children after school hours or during the weekends. Once a week, the children will be able to join the camps, enjoy reading books and creating simple learning aids from locally available materials with the help of volunteers.